This week’s theme for #DigiLitSunday is “Slicing our lives”. Head on over to Margaret Simon’s “Reflections on the Teche” for additional posts. 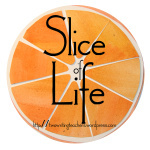 Slicing our lives is what many bloggers do each Tuesday throughout the year. But when March arrives (whether like a lion or a lamb), it’s time for the “Story Challenge” where bloggers write each day of the month. So that’s 31 consecutive posts to write as well as to respond to fellow bloggers in the community! This year is the 10th annual SOLSC so that’s a whole lot of stories. It’s an opportunity to write stories every day and live a more writerly life . . . in public. Sharing stories allows us to build a community of writing friends. Perhaps in the first year of slicing, you only read the posts of those persons who post just before and after you. But after a while, you branch out and look for those who write about similar topics, teach the same grade, have similar jobs, people you follow on Twitter or those you have met in real life (IRL) or face to face (F2F). It’s often considered to be a group of people joined together for a common purpose or passion. Today I celebrate both the Slice of Life Community and the DigiLitSunday Community. Friends from around the world that I rely on when I’m looking to learn more. Friends that I often meet in both the blogosphere and the Twitterverse. Friends with whom I enjoy spending time! Everyone of you that I have not yet met. I so enjoy reading the “About” section of blogs to see where you are from and whatever additional information you provide. I have gone with you to quilt shows, Africa, France, to family events, to dinner and have so enjoyed learning with and from so many talented writers! My life is richer for all the slicers that I know around the world IRL (F2F) or online! Thanks for being so generous with your time and stories! I’m honored to have so many great “blogging mentors” in my life! Thanks to so many of you for stopping by, reading and commenting. #TCRWP Staff Developers: Valerie Geschwind, Marjorie Martinelli, Ryan Scala, Amy Tondeau began this session with a “Turn and Talk”. Think of a recent goal that you have achieved. What were the conditions that helped you to reach that goal? Motivation is a Result of . . .
And then Val introduced the cycle of learning. . . in student language. I am working towards a new goal. Sometimes it goes well and sometimes it is really hard! I need my tool to know each step. I am practicing my goal all the time: in every book or in every piece of writing. I use my tool as a check-in. I can use my goal in lots of places. I can teach other people what my goal is and help them do it. I loved the idea of the three stages. I believe Brook Geller first introduced me to the belief at #TCRWP 2013 July Reading Institute that most “students are over taught and under practiced.” Many students seem to need more practice time with specific feedback and a lot less “teacher talk”. In this case a practitioner is someone who is actively engaged in the doing, who repeatedly exercises or performs an activity or skill to acquire, improve, or maintain proficiency, or who actually applies or uses an idea, a method, or a skill across many scenarios. In other words, our students are the practitioners! Practice does not have to be boring. There are many methods (see picture below) that can be used to reach “expert” status but the key to this entire presentation was that students would be working on a goal of their own choice and moving from novice, to practitioner, to expert. What wonderful language to put into the mouths of students . . . How motivating and empowering!!! Caution: These are not stages to be RACED through. They will take time to develop. Students in charge of their own assessment of these stages will definitely be students who know exactly what skills and strategies that they do have in their repertoire. Tools: Checklists, rubrics, progressions, charts from mini-lessons. However, a new look . . . Bookmarks with 3 or 4 choices. Students marked the choice that they were using with a paperclip. Clearly visible!!!! AWESOME! And then a final reminder .. . .
You’ve met your goal. Now what? It was the first time for me to hear #TCRWP Staff Developers Valerie, Marjorie, Ryan, and Amy and I’m definitely looking forward to learning from them during future opportunities!!! Of course this was a popular session so I was willing to sit on the floor (don’t tell the fire marshal) because I wanted to be able to be up front and see! Teri Lesene’s presentation is here. This fact was startling to me! Obviously I need to read more than a book a week! Kylene Beers and Bob Probst shared a great deal of information about nonfiction reading that has come from the process of writing their new book. This slide is something I want to remember. . . “when I have answers I need to question”. And this one on the importance of reading. Maggie began this session with many great connections. “We haven’t seen teachers work harder than they currently are, YET sometimes students aren’t working so hard! ” Tools can help students buy into learning. Tools, in our daily life, extend our reach, meet our needs, help us tackle big problems and personally get better! Tools connect, access, build community . . . should change over time! And then a typical problem from narrative writing. . . How to stretch out a frozen moment. Kate created a demo page in front of us and told us it was, “Messy!” Lean on a menu of ways, decide the color scheme, and title. Another tool might be a Micro-Progression. It provides a clear description of behaviors that are expected so students will know where they stand. Middle level is good. Students don’t always have to think they should be at the top level of performance. Bookmark – 5 or 6 most important things for students to work on. Let students create this for themselves. They can be different! Mike – Framework for creating tools adapted from The Unstoppable Writing Teacher with a shout out to Colleen Cruz. Do not plan to use a tool forever. Have a plan to remove the tools. Some tools we will always need (the hammer), some we want to go away/become automatic (steps to hammer a nail) Some tools become references, set aside until needed. Sometimes need an additional/alternate tool. Most writing tools are not designed to be used indefinitely. News : Spring 2016 a book from Kate and Maggie!!!! SO EXCITED! I think I know this boy! Seymour’s part was actually titled: Celebrating the Wonder in Nonfiction Storytelling. He began with a discussion of what nonfiction really means. If nonfiction is really “not true” than fiction should be “not real”. There is something about the use of “non” that marginalizes the texts that are labeled nonfiction. After all, who takes anything with “non” in the title seriously? Not much difference between teaching F and NF. . .
Mystery, wonder, poem, the universe! Mentor texts plus teacher modeling equals quality student writing. When teaching writing, FOCUS! If the target lesson is about leaving spaces between words, only teach “leaving spaces between words.” Don’t teach everything in the world of writing. If the focus is “leaving spaces between words” – that’s the teacher talk! On mentors and models – read the book once to enjoy, then mine for craft. Use a favorite book over and over and don’t forget to use it for conventions! Here’s an example from Hank the Cowdog. Create a culture of Curiosity. 9. Make sure learners are writing all day long. Write to remember. Write to question. Write to think. Write to express yourself. Write to share your learning. In every subject area. Students can set real goals and self-assess their progress toward their goals. Students are motivated when they have control and real choices in their work. Models and tools aid students in moving through a cycle of novice to practitioner to expert. What are your thoughts about involving students at this point? Thousands of attendees and thousands of views of #NCTE15 . . . What will you remember? The session was both funny, illuminating and oh, so insightful. After all, it was an introduction by Katie Wood Ray (who taught Matt Glover everything he knows as well as thinks of the greatest book titles EVER! ), Kathy Collins and Vicki Vinton. I would be remiss if I didn’t also mention the illustrious crowd present: Kylene, Donalynn, Franki, Maggie, Katie, Christina, Dani, Katherine, Ryan, and Katie and many others that I did not see from the front row! We explored these beliefs and the important qualities of readers. And the question: How do we brand our reading? How do we really help students understand the importance of reading? Kathy also spent time on belief # 3 – how do we appreciate that quirky child (annoying, yes) and make sure that he/she continue to grow and learn? And belief # 8 – Joy! Such a strong belief in joy that it needs to be a secret so that publishers don’t create and market “JOY kits”! And the gifs . . . oh, my! LAUGHTER! Here’s a gif that Kathy Collins did not use but may fit your future needs! Vicki Vinton began with framing several issues with quotes and examples for the audience to consider. And an example of grade three CCSS – aligned “reading work” for teachers. And here’s the most important part of this post. I was the first volunteer for this problem-solving small group. Five of us – all adults and literacy folks – volunteered to participate in this demonstration. We had roles – as students – dyslexic, ADHD, ELL, ELL, and Unmotivated. We had never seen the script and time was fleeting. We actually read from a script and from text projected on the screen and we missed a couple of cues (“oohing” during reading) but we did “get into our parts”! As a reader, I was anxious. As a reader, I was worried about how well I could read and follow directions. As a reader, I was worried about the task. As a reader, I had no time to “think” about the text even though I scanned all my “parts” as soon as I had the script in my hands. As a reader, I wondered about “how well” we would do as a group. As a reader, I wondered if we would meet Vicki’s expectations. In the interest of full disclosure, dear readers, I must tell you that I presented on a panel with Vicki Vinton last year at #NCTE14. So I was reading a script from a trusted/respected friend/mentor. Another group member was a respected colleague. I provide PD to all sizes of groups so the actual speaking/performing was NOT really one of my concerns. If I, a confident reader, was worried about how well I would read so I didn’t let the group down, how do our students feel when they aren’t sure of the task or topic? How do students really feel when they encounter new tasks/situations? How have we structured our work/learning so that a mindset for growth is present? The work that we demonstrated was important. The students were figuring out “Minneapolis Simpkin”. The teacher had not pretaught all the vocabulary words in the book. Words from “real students” showed that they were continually revising their thinking about what “Minneapolis Simpkin”was. This was a Peggy Parish “I Can Read” level 1 book. It was not a “hard” text. But the reader certainly had to be thinking in order to make sense of the text. YET, it was a tricky text where the narrator was not explicitly revealed. The text did not say, “Minneapolis Simpkin said, ‘——-. '” Students had to do the work of figuring out the story! Before: Remember to think of the student perspective when planning your instruction. After: Do notice and name the work students did (“Who’s doing the work?”) and discuss where and when this work might be expected to transfer. What are the ideas that you want to remember from this session/post?